Argon is sitting in a parking lot in East Boston these days. We have a few projects planned for the winter and I finally got round to finishing up one. 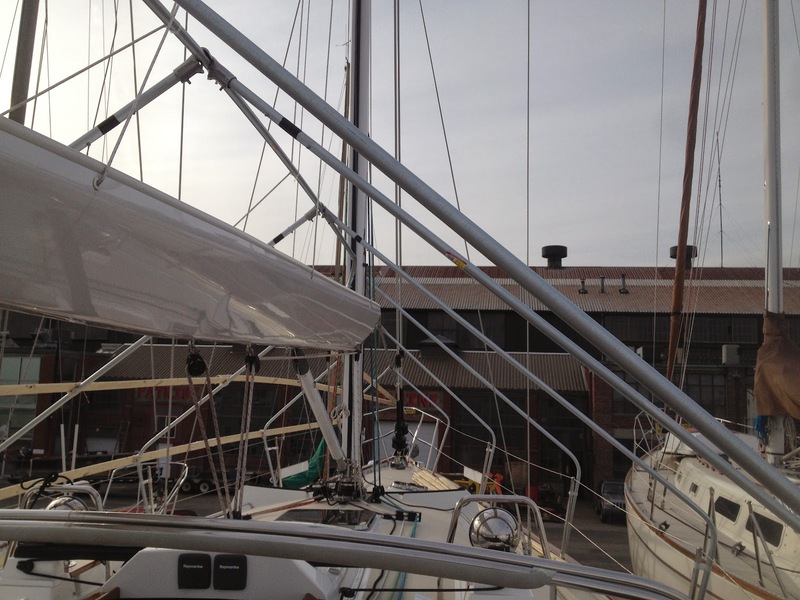 Tartan installed most of the deck hardware to support a Spinnaker. There are various blocks and bullseyes to guide the spin tack line toward the cockpit. 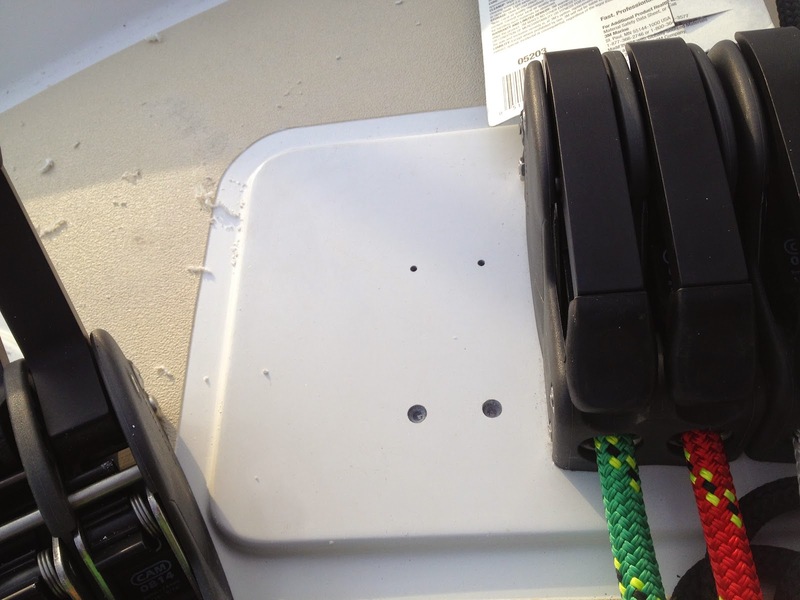 However they left us short on deck organizer blocks and a rope clutch for the tack line. 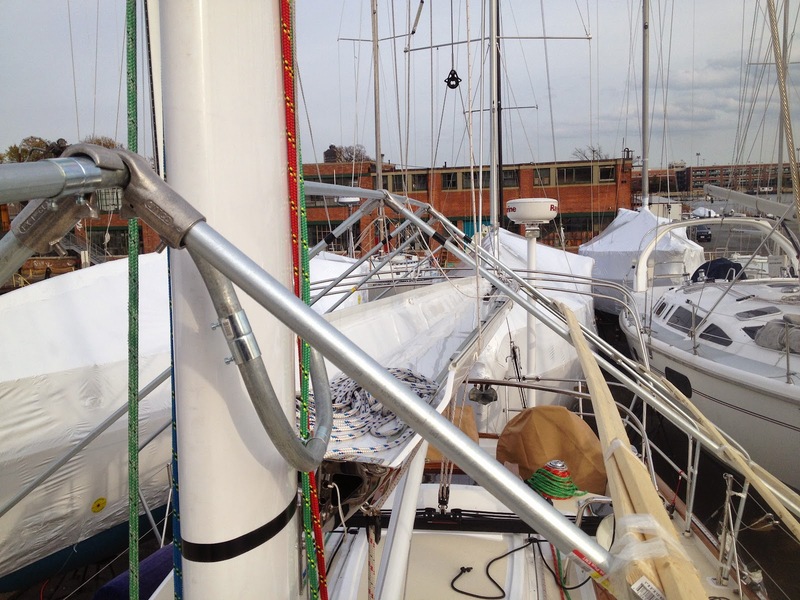 We got even shorter with rope clutches because we redid the "German" sheeting on the main and brought the main sheet to the port side cabin-house winch. The short version is that we need more rope clutches on the port side. The starboard side had two triple clutches, but the port side was fitted with two dual clutches. So I added another dual. The surface for the spinlocks has a glassed-in aluminum backing plate. On Tartans, everything is tapped into these integral backing plates. So I had to buy a 5/16-18 Tap, A drill bit for the tap size for 5/16-18 (in aluminum) and a bigger tap handle than I had. According to the interwebs, an "F" sized drill bit was what I wanted. Initial pilot holes drilled. Spinlock does not provide a drill guide so you have to use the clutch itself to mark the hole locations. Then drilled the "F" sized tap holes through the glass and Aluminum. Then 5/16" clearance holes through the glass just down to the backing plate. Ready for tapping. There is a good 3/4" of glass above the backing plate. Pretty strong boat. Tapping - trying very hard not to break the tap inside the hole. I only had WD-40 to use as tapping oil. We love that the Tartans have removable headliners. I could have done this blind, but almost certainly would have drilled and tapped right through this bundle of wires! Removing the headliner also allowed me to not have aluminum chips bouncing around above the ceiling forever. Now we can have the spinnaker tack line come back to the cockpit. 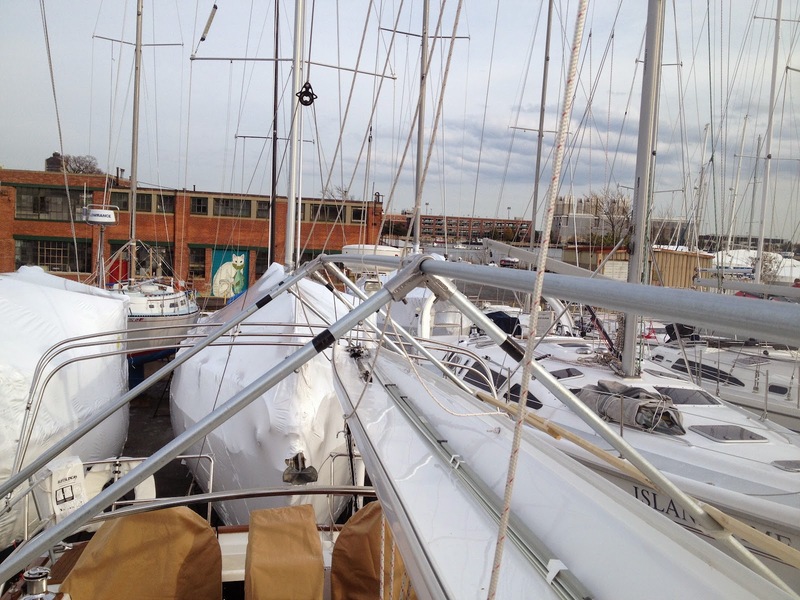 We can also shift the main sheet over so it lines up better with the winch. Not really my project, but Argon got a nice new winter cover from Kinder Industries in Bristol, RI.